The free eBook "Top Ten Tips on How to Organize Your Office" is available to download on this page. 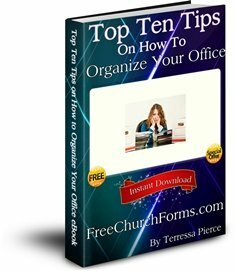 The "Top Ten Tips on How to Organize Your Office" eBook is 14 pages full of great tips of how to help organize your church office. You will learn how you can organize your office and in turn get a lot more work done and relieve stress all at the same time. If you have any problems downloading this eBook please contact me and I will send the eBook through the email. "Top Ten Tips on How to Organize Your Office" Ebook Thanks!